The Okki Nokki New MKII Refinments Make this the Best Value in RCM. Now at True Audiophile. Authorized dealer. Many of our customers know we expect the best value at every price and constant look for that benefit in everything we evaluate and carry. The Okki Nokki Record Cleaning machine with its new refinments mean Okki Nokki is the one RCM to buy. Of course there are more sopisticated RCM's costing 3 to 6 times its price, but really? If you just want to do an exceptional cleaning of your record collection to keep them in the best condition for superb sound, spend the extra on records. We recommend cleaning all brand new records before playing them. We also open and inspect each one prior to shipping. Another level of extra service you can expect from True Audiophile. For years, Netherlands-based Okki Nokki has been synonymous with one of the most effective and high-value record cleaning machines on the market, as well as other accessories, all contributing to the best possible analog playback. The Okki Nokki RCM has gained tremendous respect for its quality and functionality. Now the new second-generation Okki Nokki Mk II features even higher quality manufacturing, reliability and vacuum pressure. This cleaning machine and process is not recommended for shellac or acetate recordings. There is a one year manufacturer’s warranty for parts and labor. NOTE: Due to unpopularity WHITE has become a Special Order. We keep Black in stock. *Free Shipping is only for Continental US. Hawaii and Alaska please inquire for rates. Worth every penny! 100% satisified! I used to avoid buying used vinyl because I could never seem to get it clean. I'd end up cleaning my precious needle. But even new albums could have some annoying pops and static and I learned that all vinyl can benefit from a cleaning of this kind. It has really paid off. Barring significant physical damage to used records, I buy them now and they generally clean up very well. The Okki Nokki is the only cleaner I've used, so I can't compare it to anything else. That said, I find it simple to use and the unit is built very solid. The Okki Nokki works very well. It cleans and vacuums on the top side so you control the process (my previous cleaner worked from the bottom), it has a record clamp to prevent slipping and rotates both directions to insure the grooves are clean. Looks like the vacuum is strong enough to remove the cleaning fluid in the first pass but I give it two or three to be sure. It looks great and doesn't take much space. I highly recommend it. The solid dust cover completes the look. I wanted to buy my husband a record cleaner for his birthday so after months and months of research, I finally settled on the Okki Nokki and pulled the trigger on this phenomenal piece of machinery. I watched a YouTube tutorial beforehand and was very glad to be forewarned to look out for sellers pushing the older model with a few defects that were corrected in this new model. I did come very close to ordering for the exact same price through Amazon Prime but after heeding that warning and looking very closely at the fine print I discovered it was indeed the older model! So I went back to the YouTube tutorial and researched the company that published the video and landed here at True Audiophile. And I just want to say to anyone considering such an investment... please, PLEASE order through True Audiophile. Hands down BEST customer service, and it arrived EXTREMELY well-packaged in just a few days! 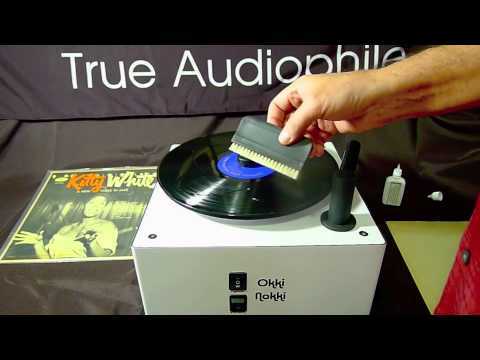 Anyway, I'm having a hard time finding words to describe the pure awesomeness of this record cleaner! We immediately cleaned up an old folk album we knew needed some serious work and it is now so crisp and clean it literally brought me to tears listening to it. As one of my favorites growing up and into adulthood, I'd listened to that record about a million times and it is quite literally the difference between night and day. I can't recommend this enough for vinyl lovers; you will hear all your vinyl in a totally new way and never look back. This thing simply breathes new life into new and old vinyl. We're hearing ALL the frequencies now… crisp, clean highs and punchy, even lows. Ear candy! The ONLY tiny thing we find a bit weird is that it doesn't come with a dust cover?? There is one you can buy separately but we're not sure why, at this price point, it would not be included. I just saw the price of those went from like a hundred bucks to about fifty bucks, but still seems odd that it would be an optional accessory sold separately as I'm sure 100% of people would rather have one than not have one. Just a minor complaint and really no big deal; we'll probably buy one eventually and not think about it again. It doesn't detract from the functionality of the product and I am still giving a 5-star review! My husband told me this is a dream come true for him to finally own something like this and I am so pleased and proud to be able to do it for him and make him so happy. He's like a kid in a candy store and it warms my heart! We are serious vinyl lovers/collectors and feel as though this machine has taken our love to a level we never thought possible. Plus, my husband is a sound guy and very happy to be turned onto this website. Great customer service and top-notch quality products for true audiophiles!! In conclusion, if you are considering the investment but may be turning a little green at the price I want to reiterate that it is worth every penny and I guarantee you will agree once you clean and listen to that first record! First, thanks to Marc at trueaudiophile.com for his excellent communication and sales assistance. About 5 months ago I was looking for a RCM. I got a Spinclean which is good for bulk cleaning but I wanted to clean a record at a time and a RCM is the only way to go. I looked at Nitty Gritty but ruled it out quickly because I didn't like the fact that it didn't have a full size platter. I wanted to clean the record with my own hand and didn't want to be able to only apply pressure in a small area. (My friend has a Nitty and the vacuum is louder too.) I'd rather spend my money on equipment and records than a RCM, so for my budget there's really only two choices, VPI and Okki Nokki. I spent a lot of time reading reviews and I was sold on the Okki for several reasons. The Okki is smaller, looks cleaner and more elegant, is made of material resistant to water or cleaner and has a two way motor. However, after reading the Stereophile review, and a few other reviews that mentioned the same couple items, I was a bit set back. Several people had trouble with the clamp down; they had trouble with the threads. Also, there were several complaints with the end of the drain plug. Shortly after reading these reviews I saw that Okki was releasing a completely redesigned MKII and I hoped they had addressed these issues. I can say the following having used this MKII for about a month. I have had no trouble with the clamp down and the drain plug is a redesign which too has not been a problem. The machine is excellent. I have the black model which looks like a piece of audiophile equipment. The vacuum is as quiet as a vacuum could be and dries the record with no problem. I saw in a couple videos when the vacuuming was complete and the wand came up it left a bead of cleaner on the record. I've had no such problem. I dry two revolutions, turn off the vacuum and it comes up clean. What impressed me most is the torque of the motor. Obviously I don't press too hard when cleaning but you can apply more than enough force without any stress on the motor and reduction in speed. The platter is solid and the mat is clean. I have seen and used the VPI and the Okki is far better, for about the same money, or less, you get a hands down superior product. I'm sure you’re wondering if there are any negatives and I do have a couple small ones. The brush that comes with the Okki is fine for a dry cleaning and OK if you're applying an enzymatic cleaner or other cleaner that is only to be spread and not "scrubbed" into the record. (You never scrub but for lack of a better term that’s what I used.) There really isn't any better brush than the Disc Doctor brushes so I recommend them highly. As I'm familiar with DD solution I am using that too and can't really comment on the Okki solution since I haven't used it yet. The cover is optional which I guess makes sense for those that don’t want one but I can’t imagine not getting the cover. It’s nicely built, but I wish it fit more snug on top. There’s a raised edge around the top and it seems it could have been fit against that edge better. The vacuum arm can swing outside the edge so be sure you have it inside before setting the cover down. The manual says to line up two bumps on the vacuum arm but there’s only one. I wonder if this is a redesign and the manual wasn’t updated. No big deal. The manual keeps stressing things not to do or the warranty will be voided. I understand their need to protect themselves but it comes across a bit confrontational. I’ll sum up by saying that I recommend this RCM whole heartedly. I would buy Disc Doctor brushes no matter what RCM I bought so that’s not an issue. The cover is a tiny personal observation. This RCM is an excellent machine and I’m thrilled with my purchase. This review is for MKI version. MkII just released resolves any small concerns.